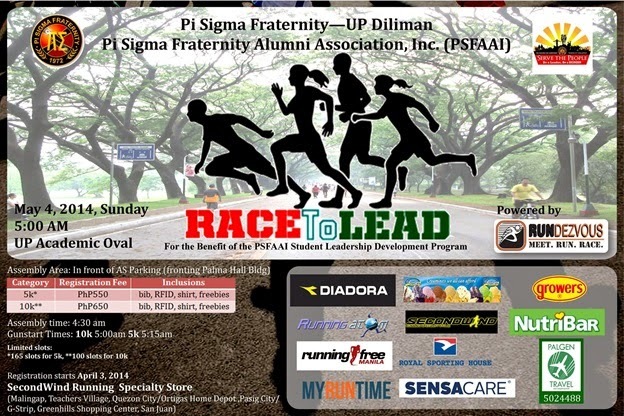 The Pi Sigma Fraternity of the University of the Philippines Diliman and the Pi Sigma Fraternity Alumni Association, Inc. (PSFAAI) present Race to Lead on May 4, 2014 to be held in University of the Philippines Academic Oval. This is in support of the Student Leadership Development Program of PSFAAI. Participants may get their official race time when they register their bibs thru My Run Time by Strider. Winners will get prizes from Diadora and a lucky participant may get a free plane ticket of their preferred local destination thanks to PalGen!